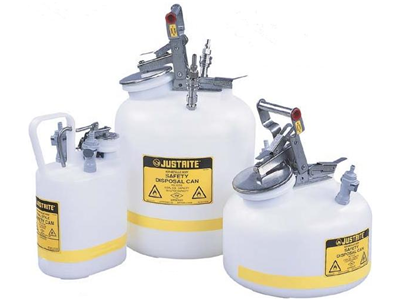 Quick-Disconnect Safety Disposal Cans offer a safe and easy way to collect liquid waste while protecting your laboratory and personnel from hazardous vapours and waste. The design is also environmentally friendly and it complies with EPA and OSHA regulations. Better Vapour and Fire Protection with built-in pressure relief to reduce the risk of fire and two-stage filter for odour control in one self-contained unit. “Quick Disconnect Valve” prevents further vapour release or solvent leakage. Safeguard against Accidents by avoiding “knock over” spills and broken glass that is common with bottle collection devices. Reduce leaks when disconnecting for disposal. Solvent flows freely from your process into the can through tubing making it suitable for either pump fed or gravity flow HPLC waste methods. Double fittings eliminate back pressure in liquid flow disposal line and provide controlled handling of vapours..
Special valved fitting offers a convenient means of detaching the can from your process without having to disengage tubing already connected to the machine. Both coupling and disconnect are valved to prevent vapour release or solvent leakage. Allows easy disconnection without worrying about vapour release, or solvent leakage as can is being moved to waste collection area. Translucent polyethylene container allows quick visual inspection of liquid level. Pouring spout is equipped with a stainless steel flame arrestor which reliably dissipates heat to prevent flashback ignition. Container automatically vents between 3 and 5 psig. Control odours with a Coalescing/Carbon Filter that captures 99% of liquid particulates. filter attaches directly into vapour release fitiing. Round-style disposal cans are available in 7.5 litre (2 gallon) and 18.9 litre (5 gallon) sizes and have a large 92 mm, strategically placed opening. Cover can be locked in open position for controlled pouring during disposal. The 3.7 L (1 gallon) oval-style can mazimises storage space and features a trigger style handle for one-handed pouring from narrower 36 mm spout. Custom designed cans are available to match your process needs. HPLC Manifold Kit enables up to four waste lines to be fed into a single intake fitting.